It’s going to be my first convention since New York Comic Con 2010, and that adventure wasn’t the most enjoyable, despite getting to play an early build of Marvel vs. Capcom 3 and catching a glimpse of Keiji Inafune before he left Capcom. It was a convention that I didn’t exactly have too much in the way of good memories, and I was pretty much disappointed with the whole weekend. That being said, as a fan of independent gaming, I am looking forward to IndieCade East this weekend. This is an opportunity for people like myself to get some exposure to the present and future of indie games, no matter the platform. IndieCade supports independent game development and organizes a series of international events showcasing the future of independent games. It encourages, publicizes, and cultivates innovation and artistry in interactive media, helping to create a public perception of games as rich, diverse, artistic, and culturally significant. IndieCade’s events and related production and publication programs are designed to bring visibility to and facilitate the production of new works within the emerging independent game movement. In short, IndieCade is all about celebrating indie gaming as a whole. Now back to why I’m excited for IndieCade 2015. This is my first major press event as a member of the Outerhaven team, not counting the Namco Press Event back in July of 2014, where we were offered a chance to preview some fun games, like Ranko Tsukugime’s Longest Day (which dropped in September in the quietest way, thanks Namco,) and Lords of the Fallen. That being said, we have a couple interviews lined up at IndieCade for Saturday, and while those are going to be fun, I’m most looking forward to seeing what indie projects that Nintendo and Sony have lined up. It’s pretty disappointing that Microsoft won’t be attending, since I am a staunch supporter of the Guys in Green, however it doesn’t stifle my excitement for the potential gaming endeavors that indie developers have lined up. 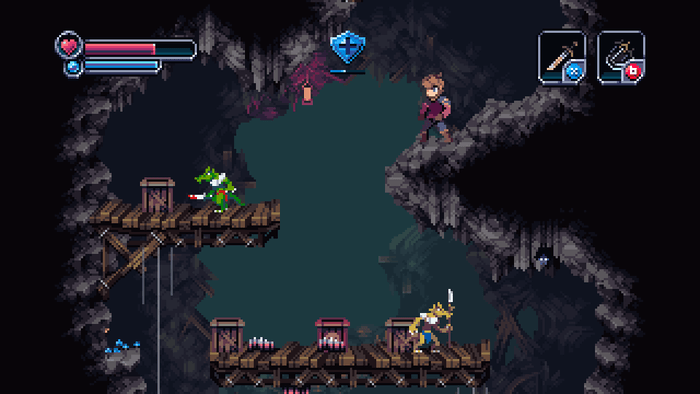 The main thing that I am extremely excited for, outside of the Nintendo and Sony showcases, is Chasm, Discord Games’ newest Metroidvania style platformer. I’ve gotten a chance to play a beta version, courtesy of Discord Games themselves, and I’m enjoying it to the fullest. It’s rightfully difficult, and I’m perfectly fine with that. While either Keith or I will save the rest of the details for the review when this game releases, let me speak solely for myself to tell you that I am rightfully excited about talking to the devs at Discord about this wonderful beast of a game. Meeting with Dave Gilbert of Wadjet Eye Games is another aspect that I can say is a little harrowing for me. Not because I’m only slightly familiar with the game, but simply because I’m slightly intimidated. As much as I love to talk, being held to 30 minutes is harrowing, because I usually end up building a rapport with whoever I’m interviewing, and then building to a long conversation beyond the time, and I feel that Dave will be someone who Keith and I will be having a fun, geeky conversation with. IndieCade 2015 is this weekend, and believe it or not, I’m pretty much as excited for this as I am for spending Valentine’s Day with my lady friend. If you’re at the Museum of the Moving Image anytime this weekend, especially on Saturday, come and say hello. I’ll probably be the one wearing a New York Yankees red and heather grey hat, or a heather grey Toronto Raptors fitted!